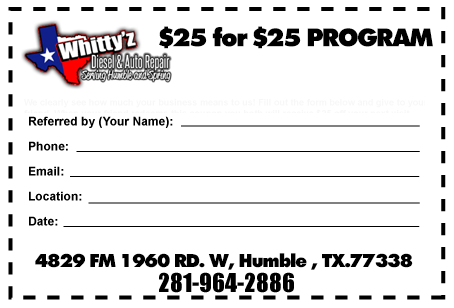 Whittyz Humble Auto Service is always looking for great referrals! That’s how we find the majority of our loyal customers. Please help us help your friends with our family owned business. Refer us to your friends, neighbors, colleagues and anyone that you know that relies on well maintained vehicles that get them to where they need to go! Click below on the Referral icon and print out the Referral Coupon. Fill out the coupon with your info. Pass it onto your friends or anyone who would appreciate our service (new customers only). When they present the coupon at their visit, they will receive $25 off their first visit. Additionally, a $25 Referral discount will be placed on your account and will be ready for you to use the next time you come in.